As we gathered for our annual all-hands meeting in Las Vegas this past weekend, many of us wondered about a Sunday morning item cryptically identified on our agenda as a “surprise event.” After spending Saturday team building and letting our hair down, we couldn’t possibly have been prepared for what Sunday’s surprise event had in store. 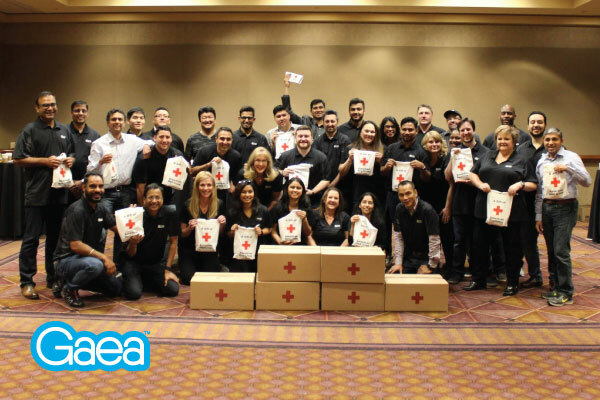 Instead of typical rah-rah speeches and company planning sessions, Gaea’s event organizers partnered with the Nevada chapter of the American Red Cross and Impact 4 Good to create a team-building event to benefit the Red Cross. Our goal was to provide the Southern Nevada chapter of the American Red Cross with 350 hygiene-care kits that will be given to families in the immediate aftermath of a disaster, each with a handwritten message of hope. The Red Cross responds to approximately 70,000 disasters in the United States every year, ranging from home fires that affect a single family, to hurricanes and tornadoes that affect tens of thousands, to earthquakes that affect millions. During these extremely difficult times, the Red Cross provides shelter, food, health, and mental-health services to help families and entire communities get back on their feet. In this time of desperation during California’s massive fires, this event really hit home. The entire team collaborated on a truly inspiring effort to pull together and assemble hygiene-care kits. We organized ourselves into an assembly line, filled the kits at remarkable speed, quality checked the kits, packed them, and delivered them to the Red Cross. It was incredible to see the team work together so well and for such a deserving cause, demonstrating the same teamwork that we are known for in delivering world-class projects to our clients. 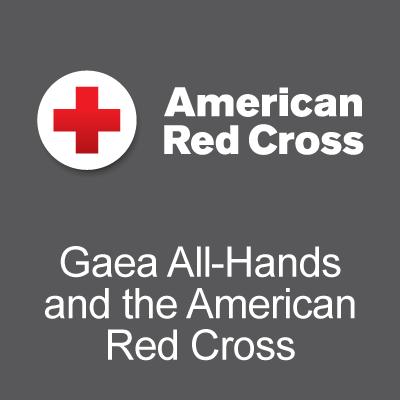 I am honored and very proud to be part of this amazing Gaea team and sincerely thank Impact 4 Good and the American Red Cross as partners who gave us the opportunity to give something that means something. This entry was posted in Blog and tagged American Red Cross. Bookmark the permalink.